There is no need to ask others help to install panels on your RV, you may try DIY. I have done it for my RV. I bought a new RV some days ago,and thinking of installing panels on my camper van. As you know, we generally use the Z-style aluminum bracket to mount a panel on the roof. We need to drill hole in the roof. It is not a good way. 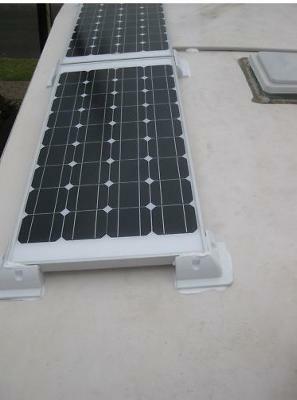 any sized aluminium framed solar panel to provide a secure fixing for vehicles, caravans, boats, etc. It supports the solar panel at the optimum height above the surface to enable aeration from underneath, ensuring the solar panel functions as efficiently as possible. 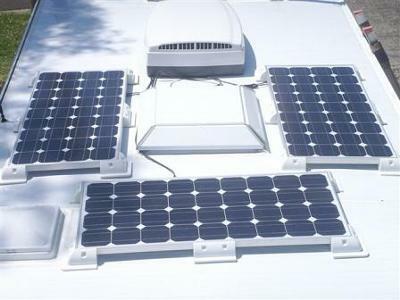 I just bought 3 sets of the solar panel brackets, and 500ml Sikaflex-252, then the panels on my RV roof. Attached are some of my install photos. Hope you can discuss with me. Does the company you got your mounts from have ones that tilt without drilling holes? I have 2 165 watt panels already mounted with 4 side z- brackets. The 2 panels are mounted on the roof and about 8" from the front of our small 5th wheel. Unfortunately only the rear brackets are screwed into rafters, the fronts are only secured by 1 screw each directly into the tin roof, along with some dicor sealant. Now that it's done I'm feeling like this is a really unsecured situation and would like to supplement these mounts some how. The z-brackets raise the panels 1 and 1/2". How high off the roof will these ABS mounts be? Do you think they would work as supplemental mounts to secure the fronts of the panels? I just bought my solar panels (2 each 100 watt panels). I've been looking at these drill less mounting kits. Are you still satisfied? A solar panel came on our 2002 Adventurer and it trickle charges the house battery. Don't know what size or anything else about it but it works. Check Amazon for ML Solar Drill free Solar panel roof-top corner kit. $28.94 for set of 4. Best efficient function of solar panels is that they can be adjusted to the optimum angle to catch solar rays...which means they need to be moveable. You have provided the link to the manufacturer. I can find no one online to buy these from. How do we get your solar info. Why are NONE of the above great questions answered? All of which are questions I'm interested in all questions as well. Why post anything then? Can you share a link to the mounts please? Could you please share what the total cost was? And I am also curious about the previous comment, re: battery pack. Can a solar panel be used for a battery trickle charge over the winter?